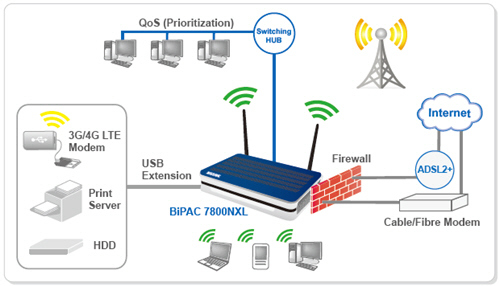 BiPAC 7800NX is a fibre-ready triple-WAN ADSL2+ modem router, an all-in-one advanced device including Wireless-N 300Mbps, Gigabit Ethernet, 3G/4G LTE, and NAS (Network Attached Storage) in one unit. It comes equipped with the latest high throughput VPN technology to fit the needs of SOHO and office users. 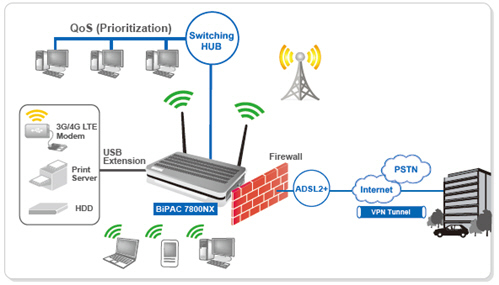 As well as being IPv6-capable, the BiPAC 7800NX ADSL2+ supports superfast fibre connections via dual-WAN connectivity through a Gigabit Ethernet WAN port. The USB port can host a 3G/4G LTE modem connecting to the 3G/4G LTE network for Internet access.